Home Blog Print Vs. Digital Signs: Is One Better? As the world surges forward, it’s undeniable that the realm of print has had to reconcile with the emergence of all that is digital. Newspapers and magazines now exist in both hard-copy and online, digital form. 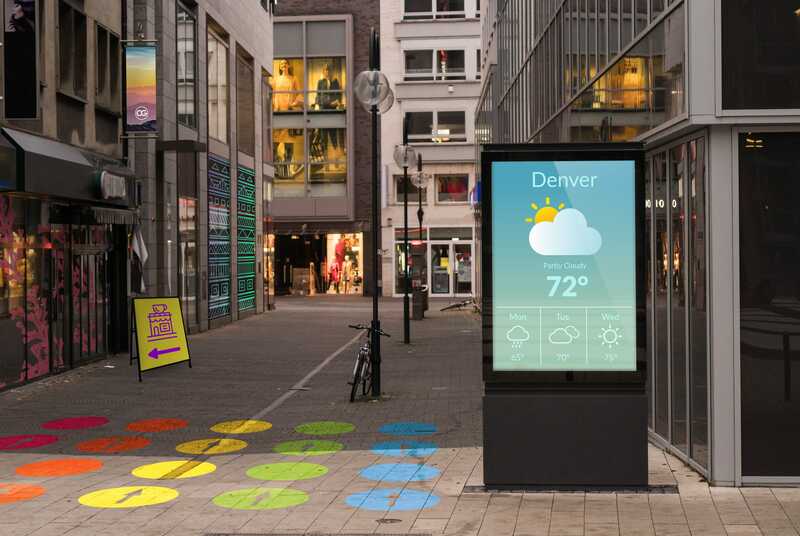 Window posters and signs now have digital counterparts, too. You can’t really get too far without being confronted by something digital. Where print was once the go-to, standard medium, the world of digital has come about and offered a different platform. Yet, print still lives on. The push-pull debate between print and digital is one that is near and dear to us, so we wanted to delve a little deeper. We unabashedly love print, but also understand the point of view from the digital dilemma. Let’s explore the two seemingly opposite signage strategies together in a classic showdown: print vs. digital. Cost: Which one is More Cost Effective? The word “budget” is one that all business owners, of both small and large companies, are very familiar with. Cost is often the first question associated with any promotional strategy. So, it’s a natural item on the agenda of the print vs. digital dilemma. The solid answer is...it depends. The upfront cost on this one can be enough to dissuade many small business owners. Though there are different entry points on the scale of affordability, generally the start-up of using digital signage is going to be a bigger hit to your wallet than a classic print option. However, if you own a business that has rotating daily deals, digital may be worth ponying up the upfront money. With digital signage comes an ease of frequent customization that most print options can’t match. Print signs can be a great, cost-effective way promote. It’s been a proven method time and time again. The net that print casts is wide; from small pamphlets, to window signs, sidewalk signs, and many more, the options that print provides are vast. Not to mention, because print is the original promotional medium, there is a huge sliding scale of cost that most can find a reasonable entry point within. For example, some of signs start as as low as $10.99. Plus some print options, like an A-Frame Sidewalk Sign, offer the perk of easy and inexpensive rotating boards. This product features a re- usable frame that can host a variety of different messages depending on your choice of re-printed panels. Gaining the trust of your ideal customer is pertinent in building your base clientele. There are many ways to approach this goal, but the way that you advertise certainly helps set the tone. Digital signage has a specific, tech-centered look. This form of advertising may work well and appeal with very specific types of messaging, like rotating weather stats that change regularly. The look of digital can come across as a bit more industrial; it that fits into the demographic that you’re looking to target, going digital may be a good thing. Print advertising is a proven and long-established medium. According to this study, print advertisement was ranked as the top most trusted channel when making a purchase by consumers at a whopping 83% of the sample size. That could be largely because it has been around for longer and the confidence in this form has been built up over time that digital advertising doesn’t yet have. Though the emergence of digital signs has forced the print world to adapt, it hasn’t forced print out of the picture and nor should it. Both platforms hold differing values for different companies and businesses. In reality, a blend of both digital and print may be the most sought- after promotional strategy. Business owners and advertisers shouldn’t look at these two mediums as an “either or,” but instead evaluate their situations on a case-by-case basis.